Promoting, offering, recruiting, coursework and thesis publishing is prohibited. Join your colleagues on the Internet's biggest technical engineering expert neighborhood. You can join and it's no-cost. 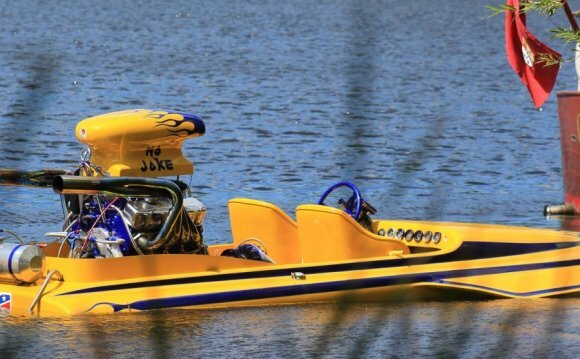 We race marathon jet boats at speeds of approx 100 mph on classes which can be around 60 kilometers long. The areodynamic form of our hull is notably unique. It's an air trapping tunnel hull design therefore we have air leaving the rear of the watercraft below as well as on the edges and above. Ours is an open seat design with canard wings on front side for lift plus wings on our roll club for lift and. The shape isn't that bad besides the open seat design and also the square straight back included. In video clips one can understand water mist being held behind the vessel at rate. My real question is what things am I able to do in order to help reduce this apparant drag behind the watercraft. I'm considering insatlling vg's regarding sides and the surface of the straight back of the ship. As I am sure as you are able to inform my understanding of areodynamics is very minimal and also at best only a lemans comprehension. Any assistance would-be greatly appreciated. Many thanks for helping keep Eng-Tips Forums free of inappropriate articles.